While you can buy a great pair of shoes for $10 at JustFab, celebrities don’t mind spending thousands of dollars on uncomfortable designer shoes at Neiman Marcus and Nordstrom. Clear shoes are the hottest footwear trend this season, but unfortunately, the see-through material puts every foot imperfection on display. Foot fog, exposed chipped nail polish, and scrunched-up toes are just a few of the clear plastic shoe disasters we’ve noticed during various celebrity sightings. 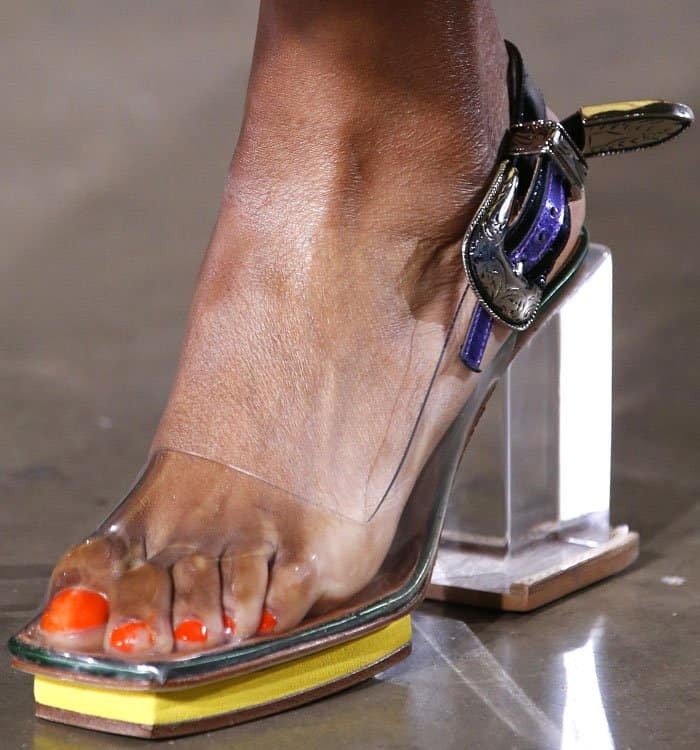 Nothing seems to deter fashion followers from stuffing their tootsies into trendy plasticky, transparent footwear. From sticky, sweaty feet to bunions and corns out in plain view, here are the worst foot problems we’ve seen thanks to this show-everything style. Let’s start off the list with something simple. Back in September 2015 when Kim Kardashian was pregnant with her baby boy Saint, she was seen strutting around in a pair of clear sandals with unsteady perspex heels that looked like they were about to break! Kim’s Yeezy Season 2 sandals were yet to be released then, and the clear shoe trend was just about to take off. We also won’t ever forget the time when the pregnant ShoeDazzle founder stuffed her poor swollen feet into clear Givenchy “Albertina” heels. Heavily pregnant Kim Kardashian in Yeezy season 2 clear sandals with perspex heels that look like they’re about to snap while leaving an office in Sherman Oaks in Los Angeles, California, on September 28, 2015. We know one of the main appeals of clear shoes is that they make legs look longer, but this is just ridiculous. Jennifer Hudson‘s toes were extending way over the soles of her Manolo Blahnik clear sandals and were spilling onto the red carpet. Other celebrities who have had the same toe overhang problem include January Jones in Yeezy’s Season 2 clear sandals and Brittany Snow in Tamara Mellon’s “Frontline” clear-strap heels. Jennifer Hudson with a bad toe overhang in Manolo Blahnik clear-strap ankle-wrap sandals at the 2014 People’s Choice Awards held at the Nokia Theatre L.A. Live in Los Angeles, California, on January 8, 2014. It’s pretty much impossible to wear shoe inserts with clear shoes, so what was Emma Watson thinking? Her chicken cutlet footpad was not only visible through the PVC panel of her Chanel pumps, but was also starting to fall out. To add insult to injury, the ankle strap of her left pump was twisted. There is just no way to hide it when you wear the wrong size in clear shoes. Alysia Reiner tried but failed to stuff her pinkie toes into the narrow clear straps of her ankle-tie sandals. Alysia Reiner with her pinkie toes desperately trying to fit into the clear straps of her ankle-ribbon sandals at the 2014 Young Hollywood Awards at the Wiltern Theatre in Los Angeles, California, on July 27, 2014. Aah, the wardrobe malfunction that started it all. Taylor Schilling’s steamy clear pumps helped us coin the term “foot fog” back in 2012. Celebrities who followed suit in falling victim to the foggy footwear faux pas include Chloe Moretz, Chrissy Teigen, and Kim Kardashian. Taylor Schilling with a bad case of foot fog in Rupert Sanderson “Prunia” pumps at “The Lucky One” UK premiere held at the Bluebird Cafe in London, England, on April 23, 2012. Yikes. 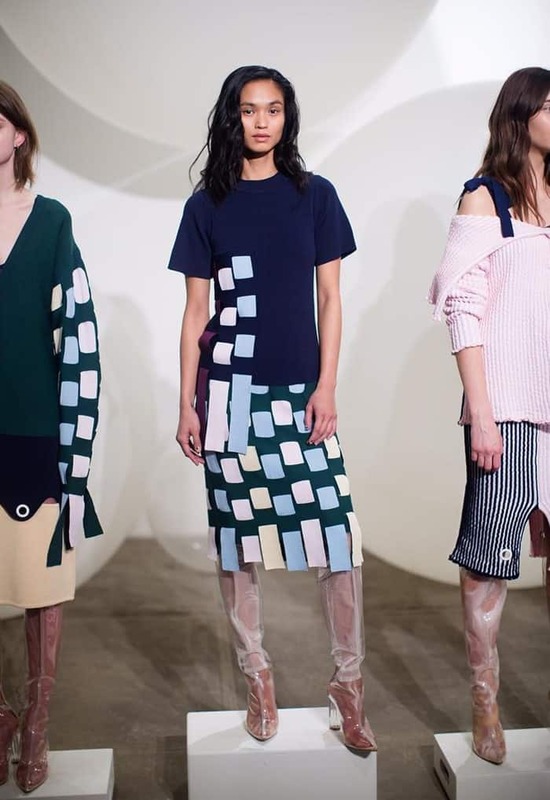 The Toga Spring 2017 fashion show featured models clad in clear shoes left and right, and the runway quickly turned into a parade of corns, chipped nail polish and scrunched-up and discolored toes. We know that finding time for a pedicure and foot treatment is practically impossible for a model during fashion week, but if you’re going to wear see-through shoes, finding time for proper foot care is non-negotiable. Clear platform sandals exposing poor scrunched-up toes and chipped nail polish at the Toga spring/summer 2017 fashion show during London Fashion Week in London, United Kingdom, on September 20, 2016. We know Kim Kardashian is always the first to sport the new Yeezy trends, and sure enough, she was spotted rocking the brand’s Season 4 clear thigh-high boots before they even debuted on the runway. But, being ahead of a trend has its downsides. Kim didn’t seem to know how to prevent her transparent thigh-highs from fogging up while she rocked a denim-on-denim look in New York. Kim Kardashian in Yeezy season 4 clear thigh-high boots that are starting to fog up while out and about in New York City on September 6, 2016. Here’s an easy math equation: Plastic shoes + warm weather = massive amounts of foot sweat. The Yeezy season 4 fashion show was a perfect storm of natural elements that turned the runway into a veritable slip and slide. Models were tripping left and right, and one ended up completely ripping off the clear shoes she was supposed to wear for the show. A number of models having trouble walking in the many clear plastic shoes and boots at the Yeezy season 4 fashion show held at a former smallpox hospital on Roosevelt Island in New York City on September 7, 2016. Amina Blue was the model who took off her faulty heels in frustration at the Yeezy season 4 fashion show — she’s at 0:19 seconds into the video above. You’d think she would’ve learned to stay away from clear shoes by then, but the German-Pakistani stunner could not resist posting an Instagram picture of her wearing visibly very sweaty clear thigh-high boots just two days after the Yeezy show. Instagram star and model Amina Blue in one of her Outfit of the Day Instagram posts showing her wearing sweaty and foggy clear thigh-high boots — posted on September 9, 2016. It was one foot-fogged model after another at the PH5 Fall 2017 fashion show at Bortolami Gallery in New York City on February 8, 2017. 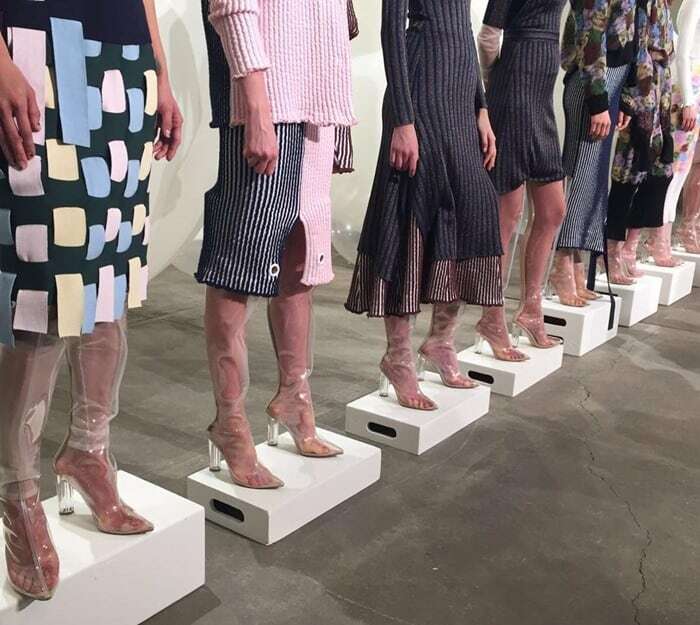 The clothes were beautiful, but the presentation was literally dampened by the lineup of steamy, sweaty clear boots. The former Victoria’s Secret Angel styled her sweaty PVC heels with a black and gold tile dress from the Salvatore Ferragamo Spring 2014 collection. The English actress made her stinky feet suffer in metallic silver toe cap pumps and a white dress at a Star Wars Force 4 Fashion event held at the Skylight Modern in New York City.